HIGHLIGHTS: Now you can enjoy top-drawer *Premium Home* comforts AND Bluefin Bay Resort ambience – in the same vacation stay. Overview - ground-level has kitchen, living/dining great room, fireplace, queen bedroom, modern AirTub 2-person whirlpool, sofabed, step on/off deck; upper-level has king and queen bedrooms, wet bar (microwave and fridge), 2-person whirlpool, fireplace, cozy deck.) Specially priced direct-from-owner, thanks to independent owner control (no resort fee). Resort's indoor/outdoor pools & hot-tubs included. Uniquely decorated & furnished with owners' personal touch. Just steps from the rocky shoreline. Guest Appreciation Coupons included (first-time guests get $25 or $35 for 3 nights, increasing nightly to $185 or $270 6 nights; return guests get $65 or $95 for 3 nights, increasing nightly to $350 or $270 6 nights; possibly less if booked under specials); each additional night brings exponentially increased $$. See ** for Coupon example. Coupons good for bikes, canoes, kayaks, golf, off-site spa services & charter fishing; fine dining; shopping; & in season skis, boards, snowshoes and more. 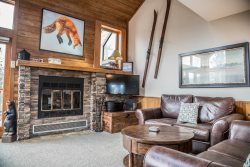 REST OF STORY: Home 57 (one of only 3 *Premium Homes* at Resort) is similar, but higher value, to a style Bluefin Bay Resort’s system labels “Grand Superior Three Bedroom Townhome.” But it definitely has a guest-friendly "look & feel" of its own. Sumptuous master king bdrm; 2 queen bedrooms; sofabed, too, if needed (but never add’l-person charges for sofabed). Custom rugged peeled-Aspen and Hickory furniture, northwoodsy styling. Waters of the mighty Lake just steps away. Lounge on large deck & relish sounds of waves. 4 ceiling fans. 4 HD TVs. Amenities galore: Famous Keurig single-cup-perfect coffee. Famous K-cup flavors, all you want. World-class sachet teas & hot cocoas. Massive mirrors. Bountiful bedding. Luxurious linens. Surprisingly splendid! The home was beautiful and wonderfully laid out for our group of 8. Kids age 6 and 8 liked the pull out couch but older/bigger people said it was uncomfortable. We loved being on the end but close to the pool/hot tub/sauna. It was a great getaway! I would reserve here again! Loved the home and the quick drive up to Lutsen to ski. Really enjoyed listening to the crashing waves in February. Plenty of space, nicely appointed rooms. Would have like some basic condiments like oil for example in the kitchen. Really would have liked to have stayed longer. Loved that the outdoor pool and hot tub were just steps away, and not very busy. The home was fabulous. We were able to bike right from the house to get onto the Gitchi Gami Trail. We hiked Cascade and Temperance. Both were a short drive. The views from the master bedroom were amazing! We loved the property (Bluefin 57). It was perfect for our stay. We appreciated the guest apprecation coupons which we used for outdoor activities, spa, and dinner. We had a great vacation there.